Is it time for a snappy new Flying Scot spinnaker? Blow them away with a Mad tri radial spinnaker. Eleven colors are available for each of its 42 panels! Mad Sails is a production sail loft located in Verona, near Madison, Wisconsin. 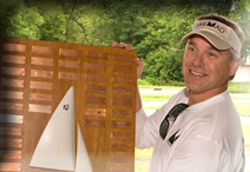 With over 20 years of sailmaking experience, owner Ryan Malmgren has been designing and building sails that have been winning regattas all over the United States. Although Flying Scot sails have comprised the majority of our business, we have also made sails for one design boats, scows, keelboats, and collegiate team boats. 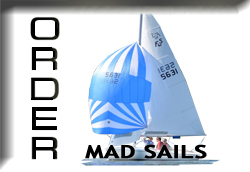 Click a tab above or category below to learn more about our sails and services, make an order, and/or contact Mad Sails today to improve your sail inventory. Buy sails 100% made in the USA! Make your boats go fast! Find out more about Mad Sails and its owner, Ryan Malmgren, who designs and makes the sails. Order our sails- 100% made in the USA! Designed and built by a master sailmaker, our sails win races! 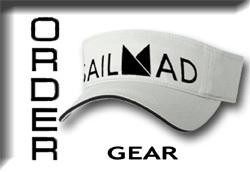 Order accessories or the Mad Sails logo on a variety of apparel.